National Street Food Festival has stepped into its third year. From its modest beginnings in Press Club in 2012, National street food festival is the most awaited event for Delhi’s food lovers.For the past two years, NASVI’s food fest has given us the best of the littis, puttus as well as award winning Chicken 65. With litti mutton, litti chokha, and litti chicken and taas kebab winning the hearts of food lovers over the past two years, this year’s pleasant discovery was Jharkhand and Himachal Pradesh. But we started our trail with our first love… Litti-Mutton. For all of you who are planning to hit the street food festival in Jawaharlal Nehru stadium during weekend I would suggest you to try out Dhuska. Dhuska are crisp fried discs made from rice and gram flour, with a hint of saunf and bay leaf.Perfectly seasoned this crisp discs are served with potato and green peas curry and bamboo shoot pickle. The bamboo shoot pickle is spicy and is a perfect accompaniment with another fried snack called gullele. Round in shape, this fried snack is prepared from wheat flour, salt, green chillies, crushed fennel seeds, bay leaf and a pinch of baking soda. A perfect snack in a winter evening. Next on my card was chicken pitha. 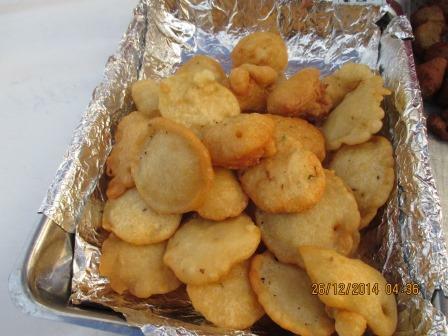 Pitha as all of us know are rice cake(steamed and fried). There are various versions of rice cake across Assam, Orissa, West Bengal, Bihar but chicken pitha was a pleasant surprise. I waited for the other foods to settle down so that I could dig into chicken pitha. If you are a vegetarian you can settle for mushroom pitha as well. Prepared from a mix of boneless chicken and rice flour the chef behind the oven, explained to me the recipe as she dished out one pitha after another with utmost care, and passion. As I watched her in rapt attention, my partner in crime already decided to settle for another snack from Jharkhand. 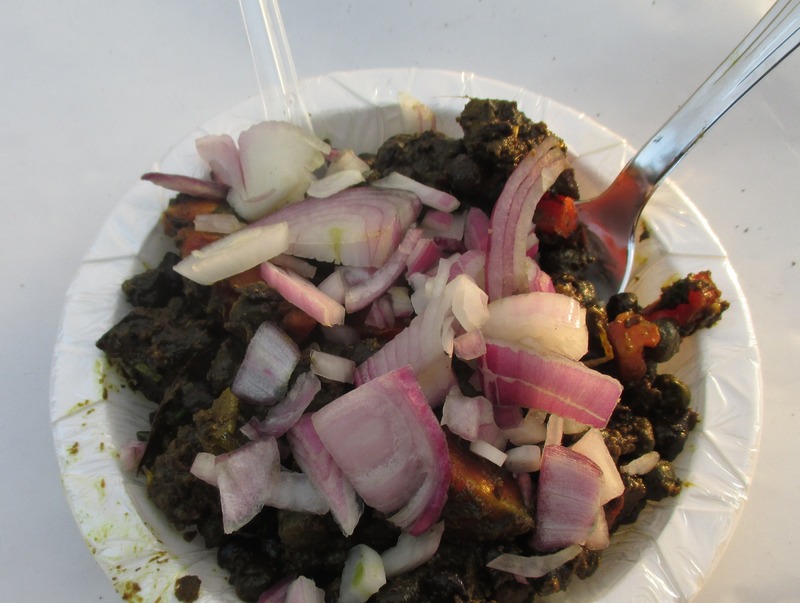 Mutton liver fried with chana! Delicious! Must try. 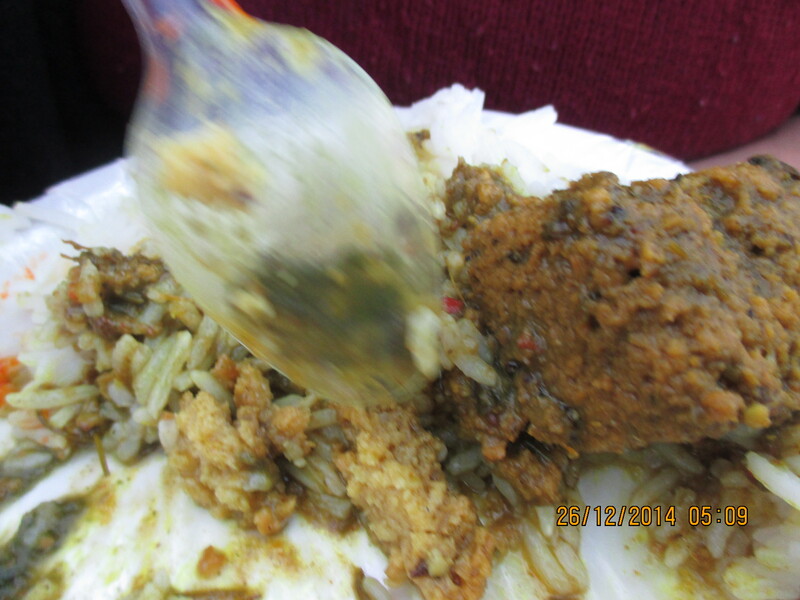 My final recommendation would be Sepu badi with rice from Himachal Pradesh. The grandeur of the festival has clearly caught up with the festive season. As it has stepped into its third year, it would have been wonderful to have street foods from Kashmir, Arunachal Pradesh, Mizoram, Nagaland and Manipur. I really missed the luscious crab curry from Orissa and wish the taas kebab was served with chura instead of roti. NASVI’s street food festival continues to be one of the most awaited events and incase you are planning your weekend lunch, head to Jawaharlal Nehru Stadium tomorrow and day after. The festival comes to an end on 28 December. 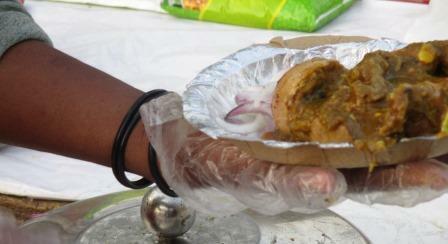 Time to grab my packed dinner of litti-chokha from street food festival. Good night, gorge on street food and stay warm. Venue: Jawaharlal Nehru Stadium, Gate No 14. The past few days have a gastronomic delight. While I was walking down from Campus and complaining about the cancelled music class, A called. A asked me to join her at Patel Chowk, Metro Station as she was going down to Street Food Festival 2012 with two of her other friends. National Association of Street Vendors of India has organised a three day street food festival in the Constitution Club. It is located at a 5 min walking distance from Patel Chowk Metro Station on the Yellow Line ( Jahangir Puri- HUDA City Centre) . As you enter the constitution club you have to buy Rs 20 pass to enter and then buy food coupons. Well, we had gone on 14 December 2012 around 6.30pm. Remember to pick up the list of food stalls with food items on offer before you head towards the food pavilion. We decided to check out the food stalls( 44 ) offering street food delicacies from Rajasthan, Delhi, Gujarat, Punjab, Andhra Pradesh, Uttar Pradesh, West Bengal, Madhya Pradesh, Karnataka, Bihar, Tamil Nadu, Kerala and Odisha. The prices of food items were between Rs 10-50. We started off our leg of street food tour with Jhal Muri(a Mixture of puffed rice with onions, chillies, mustard oil and special spices) and pakoras (Mocha Chop and Dim Chop). Well that was just the starter. Following our leg of research we settled to buy food coupons worth Rs 120 and settled to buy Mutton makhan Wala with Roti from Karnataka (Stall No 34) all for RS 40. While we were having mutton a friend bought himself Litti with meat (Rs 30) which was splendid. 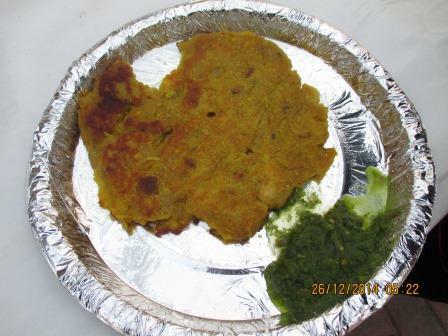 Needless to say it was from Bihar’s food stall which had the following delicacies to offer : Meat ( Mutton of course! )Rice @ Rs 35, Litti chokha for Rs 20. 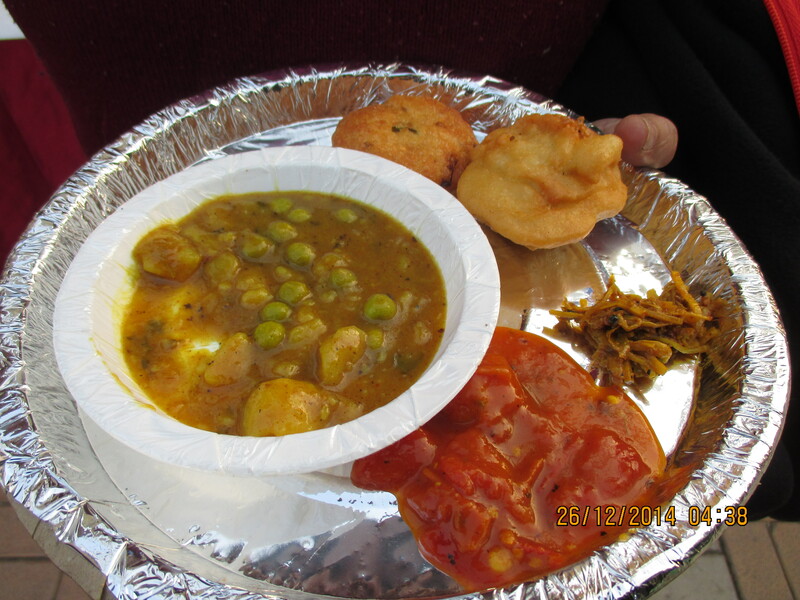 There was another stall by Bihar selling piping hot Jalebi and Rabri and Raspua for RS 30. All four of us decided to vote for Bihar ( Stall No 36). We loved the plain and simple Pongal with Adirasam from Tamil Nadu (Stall No 38)and Dal Baffle from Madhya Pradesh ( Stall No. 28). A must try for all the vegetarians!!! In case you want to opt for takeaway you can pay them Rs 5 extra and they will pack it for you. Incase you are planning to indulge on a nice spread of street food from few states across India here is an opportunity to indulge in the vegetarian and non vegetarian delicacies on offer. 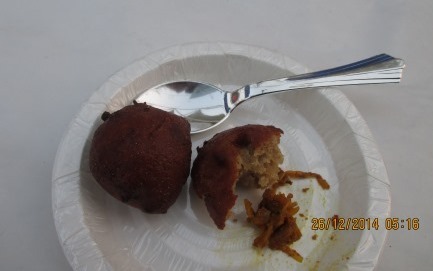 The street food festival comes to an end on 16 December 2012; 10pm. There is still time to head to Rafi Marg. We should have such events more often … Ah what a gastronomic delight!!!! 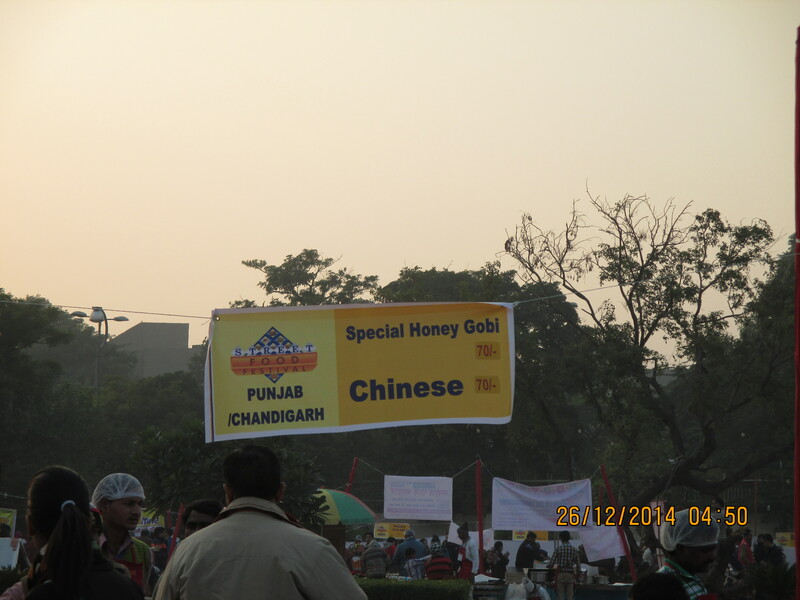 Venue : Street food Festival 2012, Main Lawns, VP House, Rafi Marg, New Delhi. Nearest Metro Station: Patel Chowk. For more details regarding National Association of Street Food Vendors visit http://www.nasvinet.org.